The carry trade has a simple aim: Borrow low and lend high. 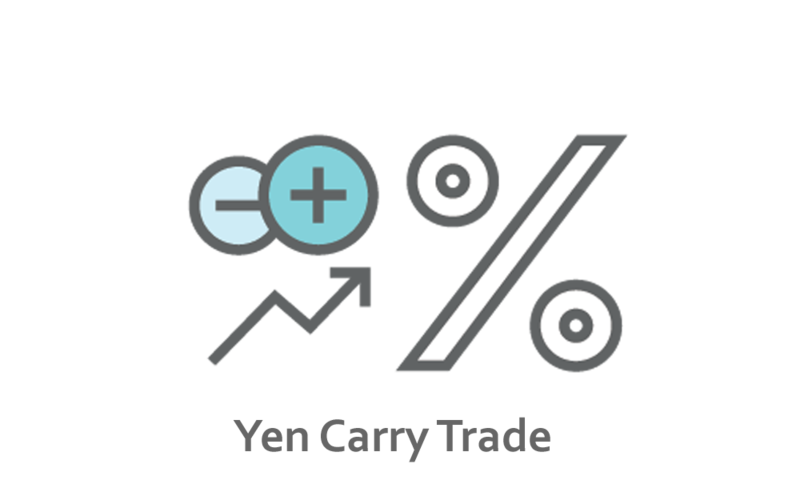 Japanese yen is often the borrowed currency in carry trades. This is because it’s cheap. With negative interest rates the Bank of Japan is paying people to take currency off their hands. That fact has made the yen a cornerstone of numerous carry trading strategies over the past few years. This is all well and good. But with the value of the yen rising sharply over the past 6 months, carry traders are now finding themselves having to buy back yen at much higher rates. When this happens, the relatively small income from carry interest can easily be wiped out. Over the past twenty years Japan has set ultra-low interest rates as the country has made a dedicated effort to bring life back into the economy. At the same time the Bank of Japan has run a massive stimulus plan in the form of quantitative easing. Quantitative Easing uses newly minted money to buy government bonds. The effect of this is to push down real interest rates across the board. With all of this going on why then would the yen be rising? Lately, this “high octane” monetary policy has been showing some small signs of progress. While there’s still a way to go, growth has picked up in the first quarter and the economy has posted five consecutive quarters of growth. While that doesn’t seem like very much when compared to other major economies – for Japan this is quite impressive. At the same time most of the currencies used as the lending side have had rate cuts. Central banks in Australia, New Zealand and Canada are all in a lowering cycle. Carry traders aren’t seeing much merit in holding a risky position just to achieve a 1% or 2% return. These pressures on yields are creating a steady unwinding of carry positions. 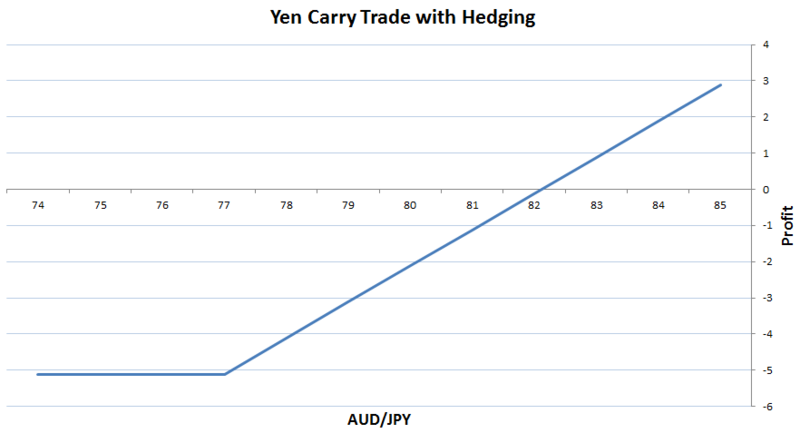 When carry trades are closed, often times yen has to be bought back. This adds pressure to an already strengthening currency. Of course a trader can always hedge a carry position. That protects against changes in interest rates and exchange rates. This can be done in a few different ways. One way involves buying out of the money yen call options. These protect against the biggest rate moves and allow a carry trader to cap the cost of buying back yen. While this limits the downside losses, the problem here is that hedging eats into already very measly profits. For example, AUD/JPY spot is 82.54 and the 3 month forward price is 82.12. A three month put option at strike 77 costs 0.13 yen. One way to capture this interest is to take a short position in a zero coupon yen bond against a long position in a zero coupon Australian dollar bond. This way we will borrow yen and lend Australian dollars. The cost of the deal, with the hedge will then be around 82.25 yen. The deal involves buying a put option (equivalent to a call option on yen) with a strike price 77. This means if AUD/JPY falls below 77, the option pays out and will cover any further losses on the carry trade. The good thing about hedging with options is that the upside remains unlimited while the downside losses are capped at where the option pays out. So if JPY does fall or AUD does rise substantially, we will still see the gain on that. But this added security does come at a price. It reduces the overall profit. By buying the option, the yield achieved on the carry trade is reduced from 2.04% to 1.40%. Keep in mind that the put option is insurance. When “perceived risk” is high the option will be more expensive, which will reduce the yield even further. Carry trade risk can also be lowered by diversifying one position into basket of multiple currencies. Normally we order the currency pairs by yield and take the top N pairs. This can reduce the overall volatility in normal markets. The problem though is that lending currencies and borrowing currencies are driven by the same fundamentals. In other words the groups are highly correlated especially at times of collapsing risk appetite. And this is when the protection is most needed. When a trader has a reasonable amount of equity in their account, this will open up far more possibilities for carry trading strategies. For one thing it allows secured borrowing. Secured borrowing allows you to borrow more cheaply than unsecured borrowing. With the cash released, a carry trader can then switch the proceeds into something with a higher return. A repo is a form of secured lending that will allow you to borrow at much lower rates than unsecured lending – sometimes just a few points above interbank rates. With a repo agreement, you sell bonds or other securities to your counterparty and agree to buy them back at a later date at a given price. The borrowed funds can then be converted into something with a higher yield, just like with a traditional carry trade. For example, this might involve buying a high yield currency outright, a bond, or a dividend paying stock. Or it might involve investing directly into money market instruments using the target currency. Possibly even by entering into a reverse repo and profiting from the spread between the two deals. If a trader doesn’t have the funds or assets to enter a repo agreement, they may be able to use collateralized borrowing. For example, suppose you own 1000 shares in Microsoft Corp. At current prices, the value would be around USD 70,000. If your broker allows a 40% loan to value (LTV), that would allow you to borrow up USD 28,000 at their secured rate. 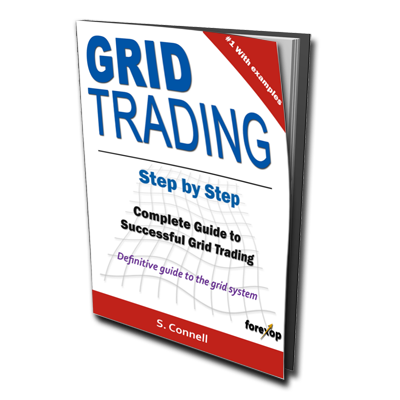 Of course, these strategies involve considerable risk unless you have sophisticated hedging in place. Exchange rates can still move against you. Finally, not to be overlooked as an alternative to the yen carry trade is that of options selling. Selling naked calls or puts is extremely risky. But if you already hold the underlying, selling covered options is a fairly low risk way of generating extra income for a position that you are holding anyway. For example, suppose a carry trader has borrowed 3 month yen and is lending 3 month Australian dollars. The deal produces an effective 3 month forward price of 82.12 verses 82.54 spot. They then sell one 3 month call option at strike 84. This sale produces 1.10 yen. Their total cost per contract is lowered to 81.02. The call gives their buyer the right to buy AUD from them at 84.00 yen. If AUD/JPY remains below 84 the option will not need to be paid out – it expires out of the money. This caps the trader’s profit from any upside move in exchange rate above 84. But it does increase the yield a lot. It increases from 2.04% to 6.7%. It also doesn’t provide any downside protection unless the trader buys an OTM (out of the money) put option to cover downside losses.